The Board of Governors adoption of the current coat-of-arms design, in November 1975, marked the end of a long period of variation in design and display of McGill University’s insignia. Among the variations in design included reverse colors (white martlets on a dark background), the use of a single crown, two mottos (In Domino Confido and Grandescunt Aucta Labore), a banner surrounding the arms with the words Universitas Collegii McGill Monte Regio, and varied designs of the martlets. More critical than the problem of inconsistent design was the lack of formal registration for the arms. In 1922 Principal Sir Arthur Currie asked architect Percy Nobbs to design a new coat-of-arms. 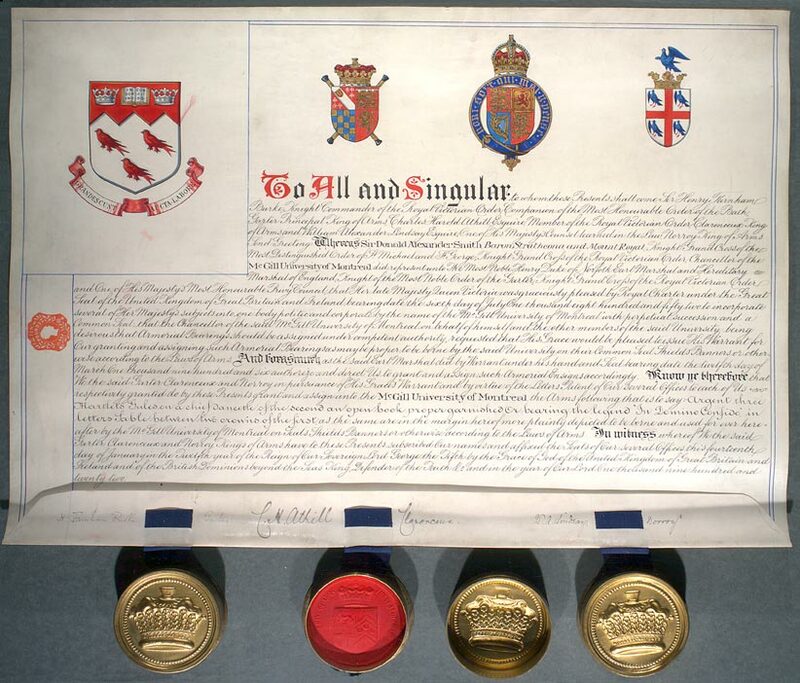 His proposal included the three martlets in red on a silver background below a red band representing the geography surrounding Montreal, with two crowns separated by an open book bearing the words In Domino Confido ("I trust in the Lord"), leaving only one official University motto (Grandescunt Aucta Labore - "By work all things increase and grow") on the scroll below the shield. 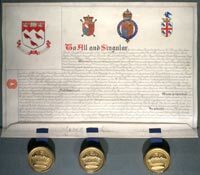 The Garter King-at-Arms in London, England, patented this design in 1922 establishing McGill University’s right to the arms. 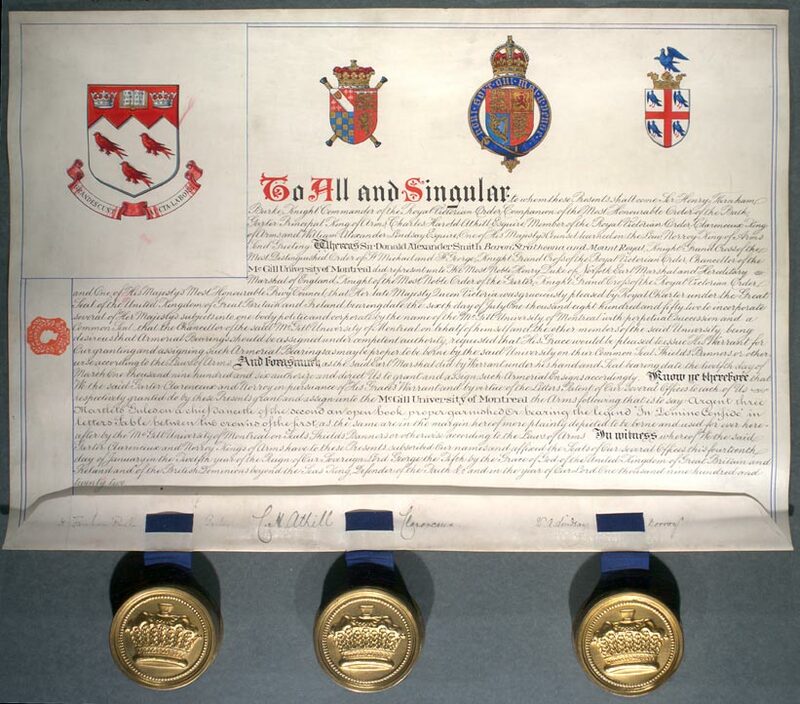 Lord Lyon King-at-Arms (Edinburgh) granted a posthumous coat-of-arms to James McGill in 1956 at the request of the University. The University’s arms were also registered, or matriculated, in the Public Register of all Arms and Bearings in Scotland in the same year. However because heraldry designations describe arms in words and not as an image, inconsistencies in the design and display of the coat-of-arms persisted until the 1975 Board resolution adopting the current version. The coat-of-arms was registered with the Chief Herald of Canada in 1992. The McGill University Secretariat, which now governs the use of the McGill insignia and word mark, has developed a policy that ensures the correct and consistent use of the University's insignia and work mark. Garter King-at-Arms: The principal king-at-arms in England, by whom arms are granted and conferred under the authority of the Earl Marshal. The office was created by Henry V, in 1420. Lyon King-of-Arms: A Scottish official (also called Lord Lyon) who derives his title from the lion rampant on the arms of Scotland. He has authority to inspect the arms and ensigns armorial of all noblemen and gentlemen in the kingdom; to give proper arms to those entitled to bear them; to matriculate such arms, and to fine those bearing arms which are not matriculated. Crest: Heraldic arms granted to, and used by, an individual. Coat-of-Arms: Heraldic arms granted to, and used by, an institution such as a regiment or university. Please note: These large image files will open in a new browser window. Click on image to view.